Irish is a great source of dog names, and you will find lots of fabulous dog names in Gaelic language. These Irish names possibly come from ancient genealogy, Irish place names, or Irish legends and folklore. Today many of these Irish origin names are very popular in America. If you are looking for an Irish name for your newborn puppy, you may be interested in these trendy Irish dog names. From Austin and Connor to Molly and Kelly, we have figure out our collection of top 20 popular Irish dog names. And most of all, they are all very popular and hot in America. 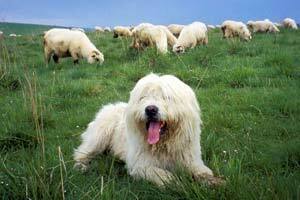 Check out the list separately for male dog names and Irish dog names. Austin - Irish form of Augustine, a Latin name meaning "great" or "magnificent." Quinn - descendant of Conn, which means "leader" or "chief." Ryan - descendant of the little king. Sean - Irish form of John, which means "gift from God." Ashlyn - means "dream" or "vision." Erin - A poetic name for Ireland, the name was recently gained in popularity in the North. Molly - Irish pet form of Mary. Shannon - Place and river name in Ireland which possibly means "little wise one." Tara - eminence or distinction.